"Sometimes," said Eliot Porter, "you can tell a large story with a tiny subject." ©Bert Gildart: Often good photography requires the paring down of an immense landscape to something that has fewer elements, and that’s what I often try and do when I enter a place as beautiful as Glacier National Park’s Many Glacier Valley. With those thoughts in mind, there’s an old snag about a mile or so from the Many Glacier Campground that I always stop to examine. It’s been there for a long time and provides cavity nesting birds with a home, and is another special component of a wild Glacier National Park. On our trip of about 10 days ago, I again stopped as we entered, and found the old snag interesting — much potential, but in ways difficult to anticipate. However, those ways revealed themselves over the course of two days, for the lighting changed dramatically and did so in ways that can only be described as magnificent. The above scene is an early morning one, made just as the sun was rising. 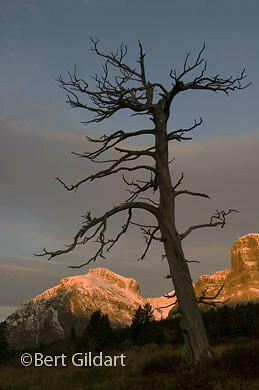 Timing was critical – for five minutes later the glow on the peaks behind the snag diminished. And then, a snow squall followed. That’s exactly the way I felt last week, for the setting lasted but a few moments, but before the rainbow’s time on this primordial stage concluded, it expanded into a complete arc. But the arc also embraced man-made structures so lost some of its wilderness drama. As a result, I didn’t feel as though it measured up to what either Porter or Adams might have sought. 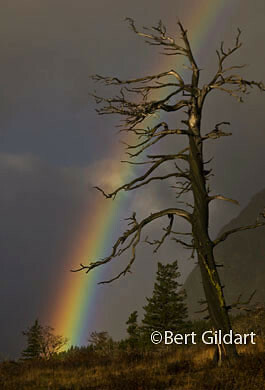 Ansel Adams believed that he often got to places "just when God is ready to have somebody click the shutter." This entry was posted on Monday, November 2nd, 2009 at 7:30 am and is filed under Glacier National Park, National Lands, Photography, RV Travel, Travel. You can follow any responses to this entry through the RSS 2.0 feed. You can leave a response, or trackback from your own site. Great photos Bert! And you’re right, returning to the same location often produces amazing results. I think this is one of your best posts on photography, so far. You make it look easy even though I know you put a tremendous amount of time and effort into getting these shots. Those are some superb images, wish mine were that competent!